Immutables is a library we recommend to create immutable objects and reduce boilerplate code to a minimum. 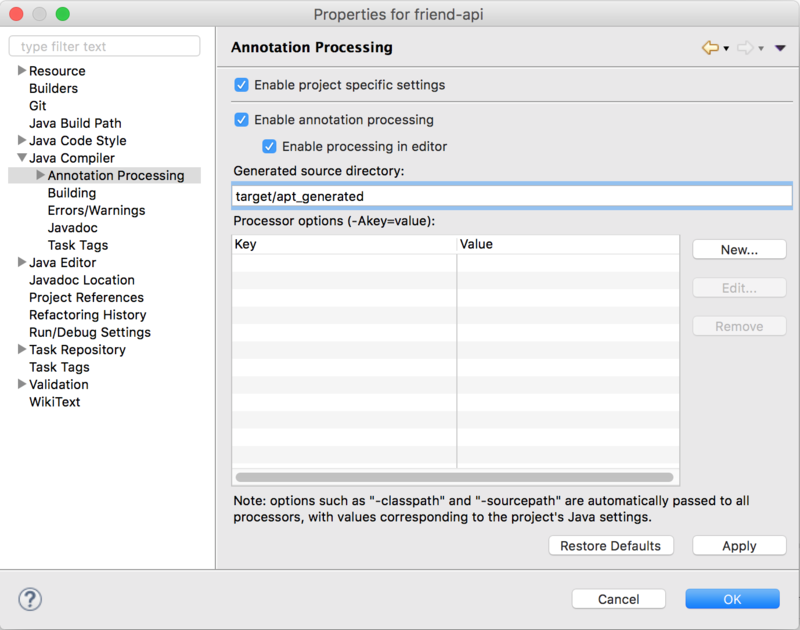 We believe you will find this library handy, but because immutables generates sources from annotations, you need to enable the Java compiler annotation processor. To setup the Immutables annotation processor in Eclipse you need to configure the following for each project that is using the Immutables tool to generate immutable objects. Enter target/apt_generated in the souce directory field. The first time you should click Configure Variables and enter a new variable named immutables with the path /<user home directory>/.ivy2/cache/org.immutables/value/jars/value-<version>.jar (replace <user home directory> with your real home directory, which contains the .ivy2 directory, and <version> with the version of immutables in use). 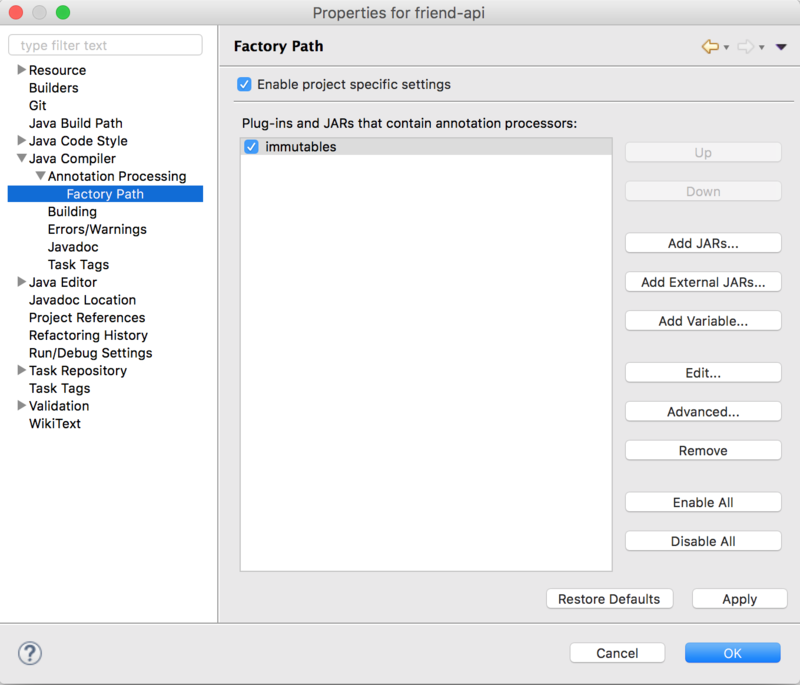 For next project you can simply select the immutables variable in the Factory Path dialog. To setup the Immutables annotation processor in IntelliJ you need to follow these instructions (there is one caveat though, please make sure to read the next paragraph) for each project that is using the Immutables tool to generate immutable objects. The one caveat is that you should set the “Production sources directory” to target/scala-2.11/src_managed/main and the “Test source directory” to target/src_managed/test, instead of using the ones recommended in the linked instructions. The reason is that there are a couple of issues related to using immutables in IntelliJ with the IntelliJ sbt plugin (specifically, SCL-8543 and IDEA-117540). Finally, under “Project Structure” you should undo the exclusion of the target-directory and verify whether target/scala-2.11/src_managed/main is marked as ‘Sources’ for each module.